Reckless – Flawed, Cracked… But Rare! I have been reckless at times… more often than I would like to admit. Most of those times it is a result of an omission on my part to consider the possible consequences. But, this time, I threw caution to the winds in spite of knowing all possible repercussions. I would admit that anger, perhaps misplaced, had a lot to do with what I did. What did I do? Well… Let me give you all some backstory first. It all goes back to a fine Saturday afternoon, after work (yes… I work on Saturdays. No, I am not a workaholic)… I was waiting at the corner of the road, my usual spot to catch a rickshaw home. A red Range Rover Evoque took a turn at the T along where I was standing. My eyes, behind my shades, gave a once over to the car… evaluating its size and design in one sweep from tail to nose. As my eyes reached the front windows, I saw this dude blowing a kiss at me. My eyes did a double-take behind the shades… my nose scrunched up a wee bit in surprise (or was it disgust?) and I ignored the incident. The Evoque went on its way. A few days later, I was at my usual spot, concentrating all my efforts on flagging down a willing rickshaw to my place as it was after 6:30 PM and pretty dark, when up zoomed the little Range Rover again. I did not notice the car though it was right in front of me because I had eyes only for those cute little three wheeled devils – my ride to a hot cup of coffee and some much needed rest. A deep voice called out from the car, ‘Hi… do you want me to drop you home?’ Damn… the car was doing it again… making me jump. I pointedly looked the other way. When the question was repeated with the addition of my locality being named…a silent chill went through me. How did the guy know where I stayed? I hadn’t seen an Evoque in my neighbourhood. Plenty of Jags, Audis and Beemers… not an Evoque. I would have noticed. With no response from me, the car left… and I got a rickshaw immediately after. I am at my spot. The usual agenda… Rickshaw. Home. And soon the now very familiar red car drives up… and a somewhat familiar voice again asks me if I want to be dropped home. This time I look the guy in his eye… he has a casual smile that would set anyone at ease. He says that I know him. Aah… really? How? He does not elaborate… but he does state that I should just hop in and he would get me home. I happened to be really mad at myself… and I was in a self-destructive mood. I didn’t even change the expression on my face, which was one that said ‘Dude, there ought to be better fish in the sea’… and I got in. The car had a right-hand drive so I didn’t have to do the very obvious ‘give-in’ walk around to the passenger door. Once in I can’t say I didn’t have any misgivings… there was a Gallardo ride I could recall in a country far far away. There was very little conversation in the car… there was some instrumental music playing which sounded like Reiki to me. Nice interiors… no, really… I loved it. He did make me jump for the 4th time in as many days, when he called me by name. How the hell? He refused to give me his name… asking me to guess it. And to guess how he knew me. I frankly have no clue. Not yet. Nothing comes to my mind. He offered to pick me up again if he happens to be around the area when I am there… I refused… politely… maybe there was some teeth gritting involved. Anyway, I am home. Safe. 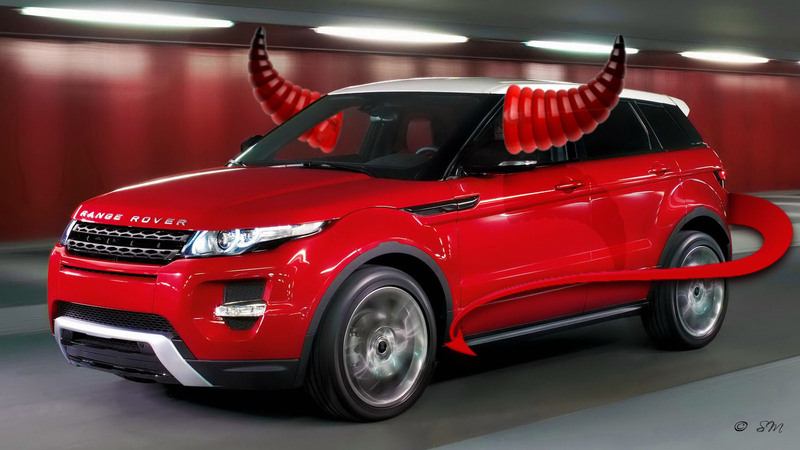 Writing this about my impulsive and some would say suicidal trip in Range Rover’s tiny little Evoque.